The Emmy®-nominated series STRIKE BACK will return to CINEMAX in 2013 for a third season of ten new episodes, which will shoot in South Africa and Hungary. CINEMAX/HBO will again produce the series with partners Left Bank and Sky, who will air the series in the U.K. Returning for season three will be Left Bank’s Andy Harries as executive producer, series producer Michael Casey and head of production Marigo Kehoe. Sky’s Huw Kennair-Jones will executive produce. Others returning for season three include director Michael Bassett (“Silent Hill: Revelation 3D”) and writers Simon Burke (“Persuasion”), James Dormer (“MI-5”) and Richard Zajdlic (“EastEnders”). Additional directors and writers will be announced as they are confirmed. Due to plot spoilers in upcoming episodes of season two, the cast of season three will be announced at a later date as well. Also returning to the drama series for next season are the show’s confidential consultants, who work in the field of counterterrorism. Their expertise is a resource for story, lingo, procedure, accuracy, character development and regional issues, providing a look inside the highly secretive black ops world. They also train the cast in battle tactics, weapons and fighting, as the lead actors do most of their own stunts. 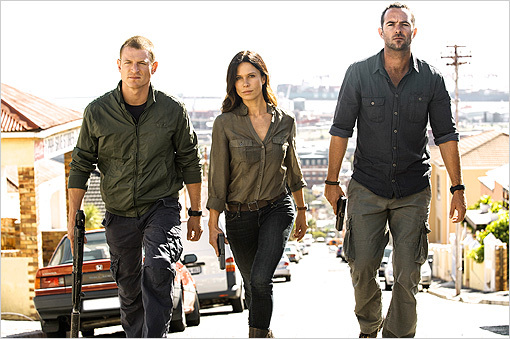 Debuting in 2011, STRIKE BACK was the first collaboration between CINEMAX/HBO and Sky. The first season introduced an unlikely pair of operatives in the stealth counterterrorism unit Section 20: Sgt. Michael Stonebridge (Philip Winchester), an exceptional British Special Forces (SBS) soldier, and the less-conventional Damien Scott (Sullivan Stapleton), a former U.S. Delta Force member. In the second season, currently debuting new episodes Fridays at 10:00 p.m. (ET/PT) and concluding its run Oct. 12, the team tracks nuclear triggers stolen by a powerful businessman with dangerous geo-political ambitions, while the two lead characters face personal challenges and contend with the pressures of their high-stress work. In addition to Philip Winchester (“Crusoe,” “Camelot”) and Sullivan Stapleton (“Animal Kingdom,” the upcoming “Gangster Squad,” “300: The Battle for Artemesia”), season two stars of STRIKE BACK include Rhashan Stone (“Episodes”) and Michelle Lukes (“Alexander”). Season two guest stars include Rhona Mitra (“Underworld: Rise of the Lycans”), Charles Dance (HBO’s “Game of Thrones”), Vincent Regan (“Snow White and the Huntsman”), Liam Garrigan (“Pillars of the Earth”) and Shane Taylor (“Band of Brothers”). Recently nominated for an Emmy® in the category of Outstanding Main Title Design, STRIKE BACK was the first original primetime series on CINEMAX in more than 15 years. The next series to debut will be “Hunted,” launching Oct. 19, starring Golden Globe nominee Melissa George (“In Treatment,” “30 Days of Night”) and created and executive produced by Frank Spotnitz (“The X-Files”), followed in Jan. 2013 by “Banshee,” executive produced by Alan Ball (HBO’s “True Blood”) and Greg Yaitanes (“House”). This entry was posted on Wednesday, October 3rd, 2012 at 2:12 pm	and is filed under News, Television. You can follow any responses to this entry through the RSS 2.0 feed. You can skip to the end and leave a response. Pinging is currently not allowed. « The Red Band Trailer for ‘Movie 43’ Might be the Best Thing You See All Year!! !